If it’s your first visit to France, it might not cross your mind to visit Brittany. 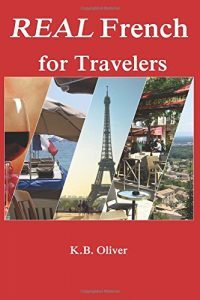 Your first trip will likely take you to Paris or Provence. But once you’ve gotten the City lights and the land of olives, basil, and garlic out of your system, you may be ready for a change of pace. There are many rolling hills and peaceful landscapes in Brittany, though my favorite destinations aren’t typically rural. Even here in the midst of this lush, unspoiled land there are towns that require a visit. One of these is Dinan, about 4 hours by train from Paris, and around an hour from St. Malo and Le Mont Saint Michel. If you are already in one of these cities, you can’t neglect Dinan. And if you’re not, Dinan deserves a special trip. My first visit to Dinan was a stop-off after a short vacation in St. Malo (also very nice, and featured in another post!) I was so excited by Dinan that I knew I had to go back for a dedicated visit, so I got that chance a year later and spent about 3 days there. 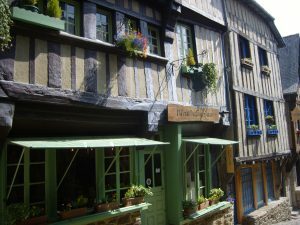 In Dinan there is a lot to see and do, yet you can relax as well. In a nutshell, you’ll make memories here, climbing castle walls, passing by 700-year old buildings, eating lots of crêpes and Kouign-amann. 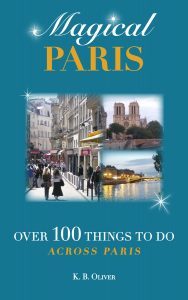 There is plenty to do, places to stay and eat, and more beauty and history than you can handle! 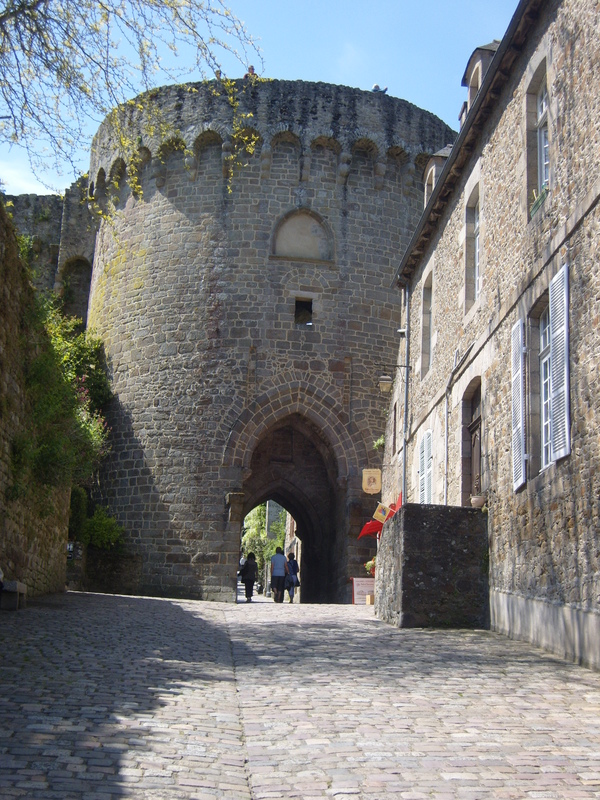 This lovely walled town is around 4 hours by train from Paris. The flavor is decidedly medieval, as the worn ramparts surrounding the town testify. You can clamber along some of these castle walls and bridges, and after that stroll on narrow, cobbled streets past shops, crêperies, and half-timbered buildings. Some of these structures are bigger on the top than the bottom, since in those days people were taxed based on the street-level size of the dwelling. The hub of town is called the Place des Merciers. Stand here and look around, imagining you are in the 1600s. The Tourist office is located at 6 rue de l’Horloge, in a 16th century house. This might be a good first stop, since they can orient you with an overview. Maps with color-coded paths will help you choose what you’d like to do. 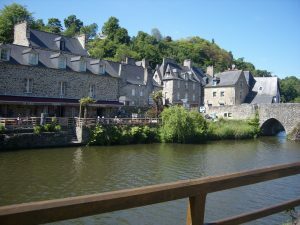 The Rance River flows through the lower side of the town, but you have to go down, down Rue Jerzual, a steep, cobbled road with shops on either side. On the way you’ll pass the Maison du Gouverneur (Governor’s house), one of the oldest buildings in town, which is open to the public for visits. When you arrive to the port you’ll be rewarded by an idyllic river valley, with a row of cafés along the tree-lined river. The Dinan Castle: built in 1382, is attached to the city ramparts. The keep and gates are part of the ramparts surrounding parts of the town. The castle is to the south of the center of town. English gardens…Jardins Anglais, near the center and clock tower. River cruise: you can get here by boat from Dinard or St. Malo, both on the north coast. The town museum can fill you in on hundreds of years of history of the town, including the castle. You’ll need to allow a minimum of a FULL day, but two to three is much better to see everything, hike and eat your way through history, and connect to the medieval ambiance. Dinan sounds just lovely! I’ve always been curious about Brittany and would love to go there. you would love it, Diane! So much to see! Would love to visit Brittany. Dinan sounds lovely!